Available in 4.8, 5.0 and 6.0 meter widths the KRM 1909 Soladrill is a new concept offering cereal growers the opportunity to use only one machine for sowing into a ploughed seed bed, min-till prepared seedbeds or direct into stubble. 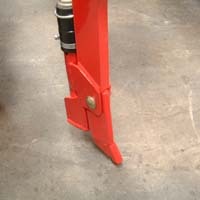 The SM coulter has a narrow rigid tine which is angled forward to pull the tip into work. 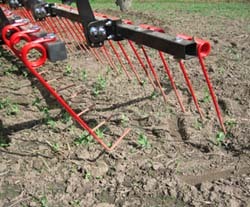 Each coulter acts as a "mini sub-soiler" creating a fine tilth and moving residue sideways. The seed is then delivered into the turbulent soil behind the narrow tine. The soil below the seed is loosened and aerated by the action of the tine, roots can therefore freely grow down into moisture giving a well established system to support plant growth. The tine is tungsten carbide tipped for maximum life even in the hardest conditions. Evenly spaced over four rows with a 40cm stagger, the 1909 coulters are able to handle large amounts of surface trash without blockage. The solatronic control box monitors all key areas of sowing including; forward speed, area sown, fan speed, hopper level and tramline management. When on a tramline bout the tramline valves save seed back to the tank, preventing over sowing and ensuring a clean start to each tramline. As standard two shutoffs are used per wheeling, three can be specified to accommodate large/flotation tyres. Heavy duty, shear bolt protected markers leave an easily visible mark. The angle of the large diameter marker disc's can be adjusted to ensure a clear mark is left in difficult seed beds. The tramlining sequence is advanced automatically when the operator moves the markers. The position of the metering unit makes calibration and rate setting simple. Rather than being tucked under the center of the hopper the metering unit is located at the front left hand corner greatly improving access. The central metering unit offers precise control of sowing rate from 2 to 400kg/ha and ensures even seed spacing. The seed is metered into a high speed air stream then distributed to the individual coulters. This unit offers easy calibration, simple setting and fast hopper emptying. Drive for the metering unit is supplied by a shaft from one of the drills large flotation wheels ensuring constant drive. Accurate calibration is performed simply by turning the wheel and collecting the metered seed. To prevent the wheel running on when the drill is lifted at the headland a brake wheel is fitted. The sowing depth is set centrally using two ratchet adjusters. The parallel linkage design ensures equal depth across the four row of coulters. Wing support wheels are standard across the range. Mounted at the extremity of the wing these wheels allow the frame to follow ground contours. To ensure accurate depth setting the wing support wheels are fitted with an identical depth scale to those on the central depth adjusters. Hydraulic folding is standard and incorporates fully automatic hydraulic locks for the coulter frame. This eliminates the need to use manual catches or insert pins prior to road work. The following harrow of the 1909 features one row of swept tines and one row of straight tines to ensure a level seedbed. Each row can be independently adjusted for angle. The maximum working depth of the tines can be adjusted as can the pressure on the tines.